It looks like July could end with a whimper. 1. No jump in July: U.S. stock futures were all declining ahead of the open, threatening to erase much (or all) of the gains made so far this month. Stocks edged to record highs last week but haven't made a decisive move higher this month. U.S. stocks ended mixed Wednesday. 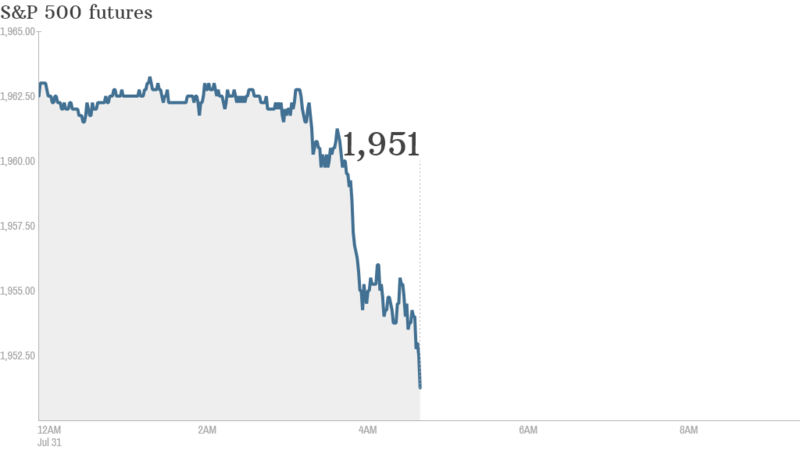 The Dow Jones industrial average ended the day down about 32 points and the S&P 500 was flat. The Nasdaq bucked the trend, gaining 0.4%. 2. Stock market movers -- Yum! Brands, Whole Foods, Adidas, Royal Dutch Shell: Shares in Yum! Brands (YUM) plunged by about 6% premarket. The company, which owns the KFC, Pizza Hut and Taco Bell brands, warned Thursday that global profits could suffer this year as sales in China tumble following revelations that one of its suppliers was using tainted and expired meat. Whole Food (WFM) shares were declining by 5.5% ahead of the open after the company issued a disappointing outlook for earnings and sales. Shares in Adidas (ADDDF) slumped by as much as 16% in Frankfurt after the sporting goods company warned that earnings may take a hit as it struggles with slumping golf sales and problems in Russia. Shares in Royal Dutch Shell (RDSA) are surging by about 4% in London after the firm reported robust second quarter earnings. 3. Earnings and economic data: A large number of companies around the world are reporting results Thursday. Anheuser-Busch InBev, (AHBIF) MasterCard (MA), DirecTV (DTV), Kellogg (K), Exxon Mobil, (XOM) and Time Warner Cable (TWC) are among the big names reporting before the opening bell. Tesla Motors (TSLA), LinkedIn (LNKD) and GoPro (GPRO) will report after the close. Tesla reported this morning it was teaming up with Panasonic (PCRFF) to mass produce batteries for its electric cars. On the economic front, the U.S. government will post weekly jobless claims numbers at 8:30 a.m. ET. 4. International markets overview: European markets were broadly in the red in afternoon trading. Germany's benchmark Dax index was declining by 1.3%. Asian markets ended with mixed results. There could be fireworks for Argentina's currency after the country defaulted on its debt for the second time in 13 years.